FOR IMMEDIATE RELEASE – NOVEMBER 29, 2018.
characters from books and stories, local bands and dance groups, community service organizations, and local businesses will process down D Street from 1st Avenue to the Mound. After the parade, families are invited to join Santa’s Block Party on 4th Avenue between C and D Streets. Members of the Fire and Police Department will greet visitors with fire trucks and police cars on display. The Convention and Visitors Bureau is sponsoring horse-drawn carriage rides and bounce houses for our youngest visitors, and will again give away a Giant Christmas Stocking filled with holiday goodies; the winner of the stocking will be drawn at 1:30 pm (must be present to win). The South Charleston Public Library is hosting Santa’s Stables on 4th Avenue, with his horses there for all to visit and enjoy. Inside the library is Santa’s Workshop with activities including games, refreshments, music, and pictures with Santa and Mrs. Claus. All events are FREE and no registration is required. Please note refreshments and giveaways are limited to the first 300 youth in attendance. 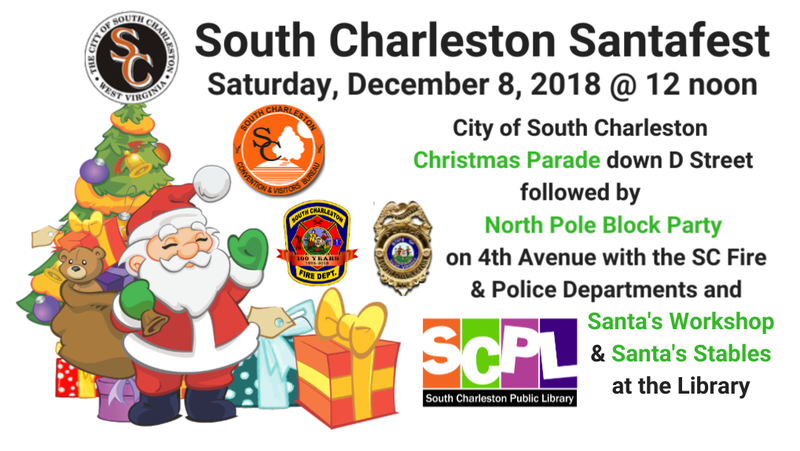 Questions about the parade may be directed to Mary or Beth at the South Charleston Convention and Visitors Bureau, sochascvb@yahoo.com , 304-746-5552. Questions about other activities may be directed to Denise at the South Charleston Public Library, denise@scplwv.org , 304-744-6561.